VISTA, CA--(Marketwired - Nov 26, 2014) - In the downtown heart of Vista sits a family owned and operated pediatric office -- Vista Village Pediatrics. Serving San Diego patients since 2009, this private practice offers personal care with Dr. Ramin Amani and his Nurse Practitioner Cynthia Clark. On Saturday, December 6th from 10:00am to 1:00pm, Vista Village Pediatrics is hosting their 1st Annual Open House and Holiday Fair to kick off the Vista Chamber Holiday Parade on South Santa Fe. Join them and some of Santa's elves before the parade for Holiday festivities including a bounce house, face painting, balloons, games and prizes. Dr. Amani will be offering hotdogs and lemonade for a nominal fee. Santa himself may even stop by, if he is not too busy preparing for the Holiday Parade! Vista Village Pediatrics cares for patients ages newborn to 18. They accept most insurance, including Tri-Care, Covered California, and low rates for the uninsured. Dr. Amani is affiliated with Greater Tri Cities IPA accepting HMOs from Aetna Health of CA, Anthem Blue Cross of CA, Blue Shield, Cigna, HealthNet, Sharp, and UnitedHealthcare. If you are looking for personal care, an accessible doctor, and family atmosphere look no further than Vista Village Pediatrics. 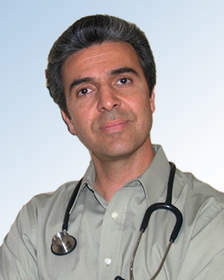 Dr. Ramin Amani specializes in pediatrics care at Vista Village Pediatrics.